The Wall Street Journal (sub. required) reports that Volkswagen is not letting up on its profits push. It reported a 20 percent increase in net income this morning, earning $6.76 billion in the second quarter. And, despite all the gloominess surrounding Europe (see Ford below), VW is staying with its forecast for the second half, partly because it is doing so well elsewhere. "Our strong position in the international markets will enable us to outperform the market as a whole-despite the challenging environment," CEO Martin Winterkorn said. Meanwhile, the other global juggernaut, Korea's Hyundai, said its second quarter net income rose 10 percent, according to Bloomberg. Hyundai earned $2.2 billion during the second quarter, and actually saw stronger sales in Europe. But Hyundai is cutting its international sales forecast, and it does expect a European slowdown later in the year. We've got one more big company to tell you about. Reuters says Nissan's net income fell 15 percent during the second quarter (which is the first quarter in the Japanese fiscal year). Nissan had higher incentive costs in the U.S. because it's clearing out older models, and it also is getting hurt because the yen is so strong. The Huffington Post says General Motors' political action committee donated to members of the House and Senate who voted against the 2008 Congressional bailout. Congress' refusal to provide money to the carmakers was the reason why they turned to the Bush and Obama administrations for help in various ways. Huffington Post says one of the recipients of a GM contribution was Tennessee Sen. Bob Corker, who led the Republican opposition that killed the bailout bill. GM made three individual contributions, to House Speaker John Boehner and Majority Leader Eric Cantor, who opposed the bailout, and to David Camp, a Michigan lawmaker who chairs the House Ways and Means Committee (Camp voted in favor). GM spokesman Greg Martin says the donations are consistent with GM's business strategy. The 2014 Mazda6 sedan will make its global debut during press preview days at next month's Moscow International Automobile Salon (teasers show it to look a lot like the Takeri Concept pictured above). It will be the second Mazda to feature Skyactive technology, which is a Mazda effort to develop lightweight, fuel efficient vehicles. 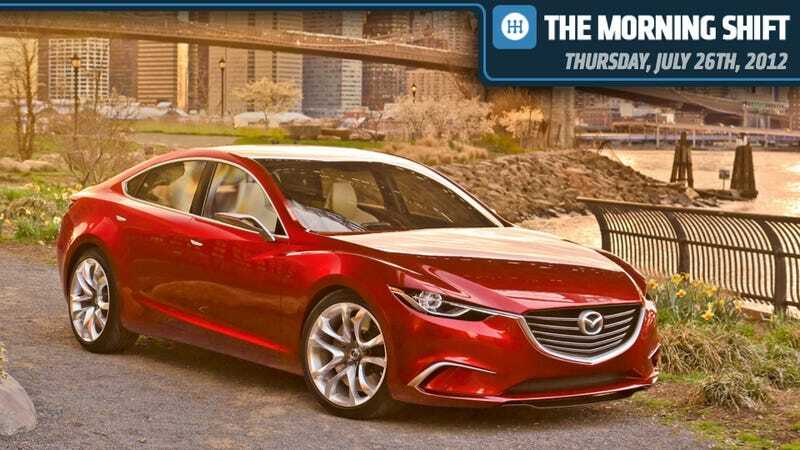 The Mazda6 will have a Skyactive 2.0-liter engine mated to a Skyactive six-speed automatic. According to Mazda, the vehicle also will feature "i-ELOOP," the world's first capacitor-based regenerative braking system. In real-world driving conditions, which involve frequent acceleration and braking, i-ELOOP, a name derived from "Intelligent Energy Loop," will improve fuel economy by up to 10 percent. More information will be announced during a press conference on Aug. 29. The San Jose Mercury News reports Tesla is insisting it will get 5,000 Model S sedans delivered by the end of the year, even though its second quarter loss increased by 79 percent from 2011. But Tesla hasn't delivered any more Model S cars since it handed over the keys to the first 10 cars on June 22, a month ahead of schedule. The paper says analysts are wondering if the company can stick to its schedule. In a letter to shareholders released yesterday, Tesla says it plans to deliver about 500 vehicles to customers in the third quarter and the additional 4,500 cars in the fourth quarter. CEO Elon Musk says the company has produced a total of 40 Model S cars, and it plans to produce at least 20,000 next year. "That's what really matters," he said on a late afternoon conference call. Musk said that he personally inspects cars when he can and blamed some of the production delays on issues with suppliers who did not meet Tesla's quality standards, including for some interior fabric and the chrome plating of door handles. Tesla is currently making about 10 cars a week, a figure that analysts say will need to increase to 375 a week, starting in October, to stay on track. Forbes says Ford has good reason to worry after its dismal earnings report yesterday. We told you that the company now expects to lose $1 billion on its European operations, and it's going to have to embark on a serious turnaround there. Forbes points out that Ford knows how to do a turnaround program, since it overhauled its U.S. operations. But Bloomberg says the North American turnaround plan is not a blueprint for Europe, which has much different structural issues. Ford was sounding pretty serious during a conference call with analysts yesterday, saying that the issues there are structural, not cyclical, which means the company can't just wait this one out. The company is being cagey, though, about whether it will be closing any plants. But, Ford is only using about 65 percent of its plant capacity, and under its One Ford plan, it's supposed to be able to build any vehicles in pretty much any part of the world. Will we see vehicles built on this side of the pond and shipped to the other side? Stay tuned. Meanwhile, across the Atlantic, Bloomberg says the French government unveiled its latest assistance program to the struggling auto industry. It also points out that Peugeot lost as much money as the French plan to provide in this round. (Comment voulez-vous dire "whoops" en francais?) One of the things the French want to do is encourage the development of green vehicles. It will raise the incentive for the purchase of electric cars to 7,000 euros from 5,000 euros and double that for hybrid cars to 4,000 euros. The bonus will also be available for fleet cars and cars ordered by public agencies. In other words, the government will give the government deals to buy green vehicles. Bon. Today, we'd like to know whether you think Tesla is going to make its production targets, or if we're seeing some signs of trouble. Of course, every new model has a ramp up period, let alone a newish car company. But, how patient should Tesla S buyers be? We'd be happy to hear from anyone who's waiting for a car. Remember there's no right answer or wrong answer. It's Neutral.